For other uses, see Aha (disambiguation). A-ha (usually stylized as a-ha; Norwegian pronunciation: [ɑˈhɑː]) is a Norwegian band formed in Oslo in 1982. Founded by Paul Waaktaar-Savoy (guitars), Magne Furuholmen (keyboards, guitars) and Morten Harket (vocals), the band rose to fame during the mid-1980s and continued its global success in the 1990s and the 21st century. A-ha achieved their biggest success with their debut album Hunting High and Low in 1985. That album peaked at number one in their native Norway, number 2 in the UK, and number 15 on the US Billboard album chart; yielded two international number-one singles: "Take On Me" and "The Sun Always Shines on TV"; and earned the band a Grammy Award nomination as Best New Artist. In the UK, Hunting High and Low continued its chart success into the following year, becoming one of the best-selling albums of 1986. The band released studio albums in 1986, 1988, and 1990. In 1994, after their fifth studio album, Memorial Beach (1993), failed to achieve the commercial success of their previous albums, the band went on a hiatus. Following a performance at the Nobel Peace Prize Concert in 1998, A-ha recorded their sixth album, 2000's Minor Earth Major Sky, which was another number-one hit in Norway and resulted in a new tour. This album was followed by Lifelines (2002); Analogue (2005), which was certified Silver in the UK; and Foot of the Mountain (2009), which was certified Silver in the UK and reached the UK Top Five 5. On 15 October 2009, the band announced they would split after the 2010 worldwide Ending on a High Note Tour. Thousands of fans from at least 40 different countries on six continents congregated to see A-ha for the last leg of the tour. On 4 December 2014, A-ha officially announced its participation at Rock In Rio 2015, which celebrated 30 years for both the band and the event. In 2015, it was announced that A-ha would re-unite for two years. Their tenth studio album, Cast in Steel, was released on 4 September 2015, and the band toured in support of the album. The band has released ten studio albums, several compilations and four live albums. In less than a year, during 2010, the band earned an estimated 500 million Norwegian Kroner from concert tickets, merchandise and the release of a greatest hits album, making them one of the 40–50 largest grossing bands in the world. The band were listed in the Guinness World Records book for having the biggest rock concert attendance; they drew an audience of 198,000 at Maracanã Stadium during Rock in Rio festival. Another record for the band is for singer Morten Harket, who was (and is still) listed in the Guinness World Records book in 2001 for the longest live note held; he held a note in "Summer Moved On" for 20.2 seconds. According to their label, Rhino, they have sold 55 million records. The trio, composed of lead vocalist Morten Harket; guitarist Pål Waaktaar-Savoy and keyboardist Magne Furuholmen, formed in 1982 and left Norway for London in order to make a career in the music were trying to think of what to call themselves, focusing on Norwegian words people could say in English. They jettisoned that idea when Morten spotted a song called "A-ha" in Waaktaar's songbook. "It was a terrible song but a great name," says Morten. They chose the studio of musician, producer, and soon-to-be-manager John Ratcliff because it had a Space Invaders machine. John Ratcliff introduced them to his manager, Terry Slater, and after a few meetings, A-ha enlisted Ratcliff as a manager as well. Slater and Ratcliff formed TJ Management. Ratcliff dealt with technical and musical aspects, and Slater acted as the group's international business manager and as liaison to Warner Brothers' head office in Los Angeles. The video used a pencil-sketch animation/live-action combination called rotoscoping, in which individual frames of live video are drawn over or coloured. It became one of the most instantly recognisable and most enduringly popular music videos in the US where it was nominated for eight awards at the third annual MTV Video Awards in 1986, winning six, including Best New Artist in a Video, Best Concept Video, Best Direction, Best Special Effects, and Viewer's Choice and Best Video of the Year. Their six MTV Award wins for that video gave them twice as many wins as Michael Jackson's "Thriller" and more than any artist in the three years of the awards combined. The band's second single was "The Sun Always Shines on TV". In the US the song peaked at number 20 on the Billboard Hot 100 and reached number 17 on Radio & Records airplay chart. A remix version was a club hit, rising to number 5 on the Hot Dance Singles Sales chart. The music video for the song was another popular and critical success, nominated in three categories at the 1986 MTV Video Music Awards and winning two awards, for Best Cinematography and Best Editing, bringing A-ha's total to 11 nominations and eight wins. The following year, Peter Gabriel would earn 13 nominations and win nine awards, also for two separate videos. In successive years, even as the award categories have expanded, only a few artists have approached — and none have surpassed — the single-year award totals of A-ha and Gabriel. A-ha's American success culminated in their 1986 Grammy nomination in the Best New Artist category, which was eventually won by Sade. "The Sun Always Shines on TV" turned out to be A-ha's last Hot 100 Top 40 single, and to this day in the United States, A-ha is remembered by the general public almost entirely because of their number one hit single, Take On Me. As such, the band is frequently considered a one-hit wonder there, despite their two Top 40 hits. In the UK, however, the story was very different: "The Sun Always Shines on TV" was an even bigger hit among British fans than "Take On Me", peaking at number 1. In the UK, A-ha enjoyed continued success with two more hit singles from the same album—"Train of Thought" and "Hunting High and Low" (with another innovative video) —and the band remained popular throughout the 1980s and early 1990s. The band's first album, 1985's Hunting High and Low, became a worldwide bestseller, spending most of October and November in the top 20 of Billboard's Top 200 album chart. The album and its four hit singles garnered international recognition for A-ha. Hunting High and Low earned triple platinum status in the UK, and reached platinum status in the US and Germany, while earning gold in Brazil and the Netherlands. Hunting High and Low has sold 11 million copies worldwide. The album peaked at number 15 in the US on the Billboard 200 albums chart and peaked at number 2 on the UK Albums Chart, and it spent 38 weeks in the top 10 in Norway, including eight weeks at number 1. A-ha's second album, Scoundrel Days, was released in the midst of the 1986 world tour, and represented a move towards alternative rock, as synthpop began to fall out of style. Although the album received favourable reviews and had three singles become international hits, the album's sales (6.4 million copies) did not match those of its predecessor (except for Switzerland, where it is A-ha's best-selling album). "Cry Wolf" would be the last A-ha single to chart on the Billboard Hot 100. After the release of the album, A-ha toured in the US, its last appearance there for 20 years. The album has been certified platinum in the UK, Switzerland and Brazil, and has earned gold certification in Germany. Ned Raggett of AllMusic Guide would later write of the album, "The opening two songs alone make for one of the best one-two opening punches around: the tense edge of the title track, featuring one of Morten Harket's soaring vocals during the chorus and a crisp, pristine punch in the music, and 'The Swing of Things,' a moody, elegant number with a beautiful synth/guitar arrangement (plus some fine drumming courtesy of studio pro Michael Sturgis) and utterly lovelorn lyrical sentiments that balance on the edge of being overheated without quite going over...The '80s may be long gone, but Scoundrel Days makes clear that not everything was bad back then." In May 1988, A-ha released their third studio album, titled Stay on These Roads, which matched the number-two chart peak of its two predecessors on the British album charts. Stay on These Roads has been certified Platinum in Brazil and France, and Gold in Switzerland, Germany, the UK, and the Netherlands. The album includes the title-track theme song to the James Bond film The Living Daylights. The version that appears on their album is a re-recording of the film version and single. The band has said that they are particularly proud of the title track, and all three members contributed to its writing. "Stay on These Roads" and "The Living Daylights" would remain part of their live set throughout the rest of the band's history. After the release of the album, the band went on a 74-city world tour. The album has sold more than 4.2 million copies worldwide. East of the Sun, West of the Moon featured a cover version of The Everly Brothers' 1963 single, "Crying in the Rain". In the late 1980s and early 1990s, A-ha were very popular in South America, especially in Brazil, where the band sold out some of the largest stadiums in the world. At the Rock in Rio II festival in January 1991, A-ha shocked the international entertainment press by drawing an audience of 198,000 at Maracanã stadium for their top-billed evening concert — a Guinness World Record for biggest rock concert attendance. In contrast, the other performers (George Michael, Prince, and Guns N' Roses) each drew less than a third of that audience, 60,000 each. In a 2009 interview from Cody Eide in Musicweek, celebrating A-ha's up and coming 25-year anniversary, the band members revealed that the record-breaking concert and the lack of media attention they received were a devastating blow to the band. The 1991 Rock in Rio festival, which should have been the band's crowning achievement, was instead a moment of crushing disappointment. "MTV interviewed everybody except us", remembers Waaktaar-Savoy. "They were all calling their bosses and saying, 'We must cover A-ha; it's the only night that has sold out.' But they weren't allowed to." "I felt very alienated," says Furuholmen. "It made us feel hopeless. We played to the biggest crowd in the world, and they ignored it." East of the Sun, West of the Moon was certified Gold in Switzerland, Brazil, and Germany and Silver in the UK. Steven McDonald of AllMusic said of their fourth album, "This is a nicely crafted collection of songs, performed and sung beautifully, with lots of echoes and suggestions tucked into the music. While not an album one can discuss at length, it's an album that's a pleasure to listen to." The album sold 3.2 million copies worldwide. Their last album before their hiatus was Memorial Beach, in 1993. Relative to previous releases, the album was a commercial disappointment. The only single from the album to chart officially outside of Norway was "Dark Is the Night", which peaked at number 19 in the United Kingdom. Memorial Beach is notably the last official American release by A-ha to date, although their material has continued to have limited availability there as imports. Despite the commercial reception, Q magazine listed the album as one of the 50 best albums of 1993. The following February, A-ha performed two concerts during the 1994 Winter Olympics in Lillehammer, Norway, followed by tours of South Africa and Norway. a-ha were also chosen to compose the official song for the Winter Paralympic Games in Lillehammer, which they entitled "Shapes That Go Together". In 1994, the band unofficially entered a hiatus, and band members then focused on solo projects. The band was invited to perform at the Nobel Peace Prize Concert in 1998. Paul wrote "Summer Moved On" especially for this performance. They also performed "The Sun Always Shines on TV". This performance was A-ha's comeback into the world of music, yet the band's set was controversially omitted from a programme of highlights of that concert that was televised in the UK, and even more controversially in the US by FOX. Nevertheless, the band returned to the studio. Those recording sessions resulted in 2000's Minor Earth Major Sky, an international tour, and a webcast performance of the band opening the new Vallhall Arena in Oslo on the 24 and 25 March 2001. A-ha's video for "I Wish I Cared" was one of the first fully web-based animated flash music videos to be made available. (The first was Duran Duran's flash video for the 2000 song "Someone Else Not Me".) The album reached platinum status, with sales of 1.5 million copies, and spawned four singles: "Summer Moved On", "Minor Earth Major Sky", "Velvet" and "The Sun Never Shone That Day". "Summer Moved On" went to No. 1 in 17 countries. A-ha made a return appearance at the Nobel Peace Prize Concert in 2001, performing a new song, Differences, and Hunting High and Low. The subsequent album, Lifelines, was released in 2002, going platinum in Norway and producing two Top 5 hits there, "Forever Not Yours" and "Lifelines". Jesper Hiro directed the video for "Lifelines", based on the short film A Year Along the Abandoned Road, which was directed by Morten Skallerud in 1991. The original short film was 12 minutes long; it shows a whole year passing by in one shot at 50,000 times the normal speed. A live album from their 2002 tour, titled How Can I Sleep with Your Voice in My Head, was released in March 2003, preceded by a live single of the 1986 hit "The Sun Always Shines on TV." In 2004, a book entitled "The Swing of Things" was published, which also featured a CD of early demo material. That year A-ha celebrated their 20th anniversary with the release of a new singles collection, The Definitive Singles Collection 1984–2004. This compilation brought them back into the UK Top 20 Album Charts, where they reached number 13 and earned a Gold album. On 2 July 2005, A-ha performed at the Berlin edition of Live 8, in front of an audience of nearly 200,000 people. They began with "Hunting High and Low", followed by "Take On Me", during which Morten Harket had difficulties hearing himself when his in-ear monitor failed: he requested a two-minute break, which he used to comment on the cause of Live 8. The intended two minutes became almost seven, and the third song, "Summer Moved On," became the last of their set. Although four songs had been rehearsed, the band's time had run out and the organisers told them to leave the stage. On 12 September 2005, A-ha played a quickly sold-out show at Irving Plaza in New York City, the band's first concert in North America since 1986 despite not having released any material there since 1993. On 27 August 2005, the band played a concert for 120,000 people in Frogner Park in Oslo, the largest concert ever in Norway. On 4 November 2005, the band released its eighth studio album, Analogue. The UK release of the single "Analogue" gave A-ha their first top 10 hit in the UK since 1988. The album includes a guest appearance by Graham Nash of Crosby Stills & Nash performing backup vocals on the songs "Over the Treetops" and "Cosy Prisons". The song "Celice" became the band's ninth to go No. 1 on a major national chart, and its music video sparked criticism for its sexual content. The following tour included a gig at London's Shepherd's Bush in February 2006, along with a TV special in Africa. In 2006, A-ha recorded a cover of John Lennon's "No. 9 Dream" for Amnesty International. It was released in June 2007 on the album "Make Some Noise". On 30 October 2006 in London, A-ha received the prestigious Q Magazine Inspiration Award for their long contribution to music and for inspiring many of their younger colleagues in the business. 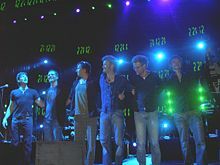 On 15 September 2007, A-ha played a free outdoor concert in Kiel, Germany. The band played on a floating stage in the harbour. This concert was streamed live on the internet via MSN. On 24 January 2009, 25 years after its first release, A-ha won the Norwegian Spellemann award for Hit of All Time for "Take On Me" on the 50th anniversary of the official hit list in Norway. On 20–22 May 2008, Morten Harket, Magne Furuholmen and Pål Waaktaar-Savoy performed concerts in Oslo, Norway, to promote their respective solo material before coming together as A-ha to play "Train of Thought", "Take On Me", and two new songs, "Riding the Crest" and "Shadowside", which previewed the new a-ha album, Foot of the Mountain. These events led up to their performance at London's Royal Albert Hall on 24 May. On 24 April 2009, A-ha surprised their fan base by releasing their new single, "Foot of the Mountain", premiering that day on Norwegian radio. The single had been completed only the night before. The song is based upon the track "The Longest Night" by Magne Furuholmen, which was released on his album A Dot of Black in the Blue of Your Bliss. The single was released on 22 May in Germany. The band promoted the song by playing it during the final of Germany's Next Topmodel on 21 May in the Lanxess Arena, Cologne. Foot of the Mountain, A-ha's ninth studio album, was released in Europe on 19 June 2009. The album's material marked a return to synth pop, similar to the band's earliest work, although the first single (and title track) was not wholly indicative of this. The band collaborated with successful producer Steve Osborne, who has produced albums for such artists as Suede, New Order, Starsailor, Doves, Elbow, and U2. "What There Is", an earlier solo track by Magne Furuholmen, was re-recorded for the album. Foot of the Mountain entered the German album chart at number 1, the UK album chart at number 5 and debuted on European Album Sales Chart at number 8. In January 2010, Foot of the Mountain was certified platinum in Germany. "I feel more connected to Depeche Mode (compared with other acts of the 80s)," claimed Magne Furuholmen. A-ha performed a cover of "A Question of Lust" during a live performance for BBC Radio 2 – The Dermot O'Leary Show on 25 July 2009. A-ha headlined the iTunes Live festival on 24 July 2009. The performance was recorded and made available for download on the iTunes site as with the previous festivals. In the Norwegian iTunes Store a-ha's release has yet to see the light of day. On 15 October 2009, the band announced they would split after a worldwide concert tour in 2010 ending in Oslo, Norway, at the Oslo Spektrum arena on 4 December 2010, with ticket sales starting the next day. The concert sold out the first day on sale. On 19 October 2009, a second farewell show was announced for 3 December 2010. To coincide with their split, the band released The Singles: 1984 – 2004 in the US and re-released deluxe versions of their first two albums (Hunting High and Low and Scoundrel Days) as well as a third and final compilation album, a new live DVD and a re-release of the book The Swing of Things by Jan Omdahl. A new single titled "Butterfly, Butterfly" was revealed on 14 June 2010 and released as a single on 5 July to promote the new, double CD compilation, 25. It was announced that this was to be A-ha's last ever recording. On 6 July 2010, the albums Hunting High and Low and Scoundrel Days were released as deluxe editions in the US through Rhino Records, featuring remixes, B-sides, demo versions, and extensive liner notes. Available in 2-disc CD and digital versions (with additional material), both albums debuted in the top 40 Billboard Top Internet Sales Chart, Hunting High and Low at number 34 and Scoundrel Days at number 36. Furuholmen revealed in an interview published in Magasinet, the magazine section of Norway's third largest newspaper, Dagbladet, that he suffers from atrial fibrillation. The news was picked up the same day by the electronic music magazine Side-Line. At the Spellemannprisen award show on 5 March 2011 in Oslo, Norway, various Norwegian artists from various music genres including Kaizers Orchestra, Ida Maria and Bertine Zetlitz performed a cover of one of A-ha's biggest hits, "The Sun Always Shines on TV", in honour of the band. After the performance, the band received the Spellemannprisen honorary award handed out by A-ha's Norwegian music colleagues with the words "Our Heroes – Once upon a time, now – still and forever". A-ha's final concerts in Oslo, Norway, were recorded by 10 HD cameras with digital, surround-sound audio. Ending on a High Note Live, mixed by Toby Alington, is available in several formats, including the band's first Blu-ray release. A single-disc live album on CD culls sixteen tracks, while twenty tracks are featured on the Blu-ray, DVD, and deluxe edition double-CD set, which comes with a DVD. A bonus documentary appears in the deluxe set and Blu-ray versions. An NTSC version is released in the US and Japan. On 1 April 2011, A-ha released the DVD as well as the box-set containing both the DVD and the CD of their last concert, Ending on a High Note – The Final Concert. The Blu-ray of the concert; however, was released on 11 April 2011. A-ha played at Oslo Spektrum on 21 August 2011, performing the song "Stay on These Roads" for a national memorial service dedicated to the victims of the 2011 Norway attacks. After A-ha's break-up, Morten Harket released two studio albums, Out of My Hands (2012) and Brother (2014). 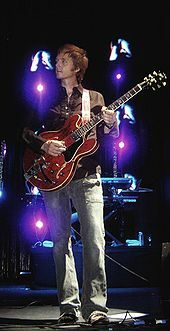 Pål Waaktaar-Savoy released two songs to the general public: with New Jersey-based vocalist Jimmy Gnecco he presented Weathervane as a new project in June 2011. Their self-titled single (Weathervane) was featured on the soundtrack for the movie Headhunters (based on the book "Hodejegerne" of Jo Nesbø). A second new song was "Manmade Lake" which was originally planned for A-ha's album Foot of the Mountain was released to Soundcloud in 2013. In 2012, Magne Furuholmen became a mentor on the show The Voice – Norges beste stemme. His talent Martin Halla won the contest and had his first album produced by Furuholmen himself who is also an esteemed songwriter/producer for other artists. In 2014, Furuholmen agreed to compose the songs and supervise the recordings for the Norwegian film "Beatles". In late 2014, rumours about new A-ha activities in 2015 embarked, to celebrate the 30th anniversary of "Take On Me". During an A-ha fan convention in Oslo in October 2014, manager Harald Wilk announced plans to re-release A-ha's first five albums on vinyl and albums 3-5 as deluxe editions. In December 2014, 4 years to the day of their final concert, the band announced that they had been invited to reunite to perform in Rock in Rio 2015. Later that year, on 21 March 2015, it was confirmed in national Norwegian newspapers that A-ha had reunited for a two-year period and writing new material. A-ha's tenth studio album, Cast in Steel, was released on 4 September 2015. On 26 October 2015 it was announced that A-ha would again be performing at the Nobel Peace Prize Concert in Oslo, Norway. The album was promoted with a European tour from March through May 2016. In March 2016, they played a live concert which was broadcast on the BBC's Red Button service and on BBC Radio 2 as part of their "In Concert" strand. In Oslo Spektrum on May the 3rd 2016, a-ha cleared away their normal stage-production to give room for a very different concert performance in collaboration with Void, a Norwegian computational design studio working in the intersection between design, architecture, art and technology. The collaboration resulted in a unique one-of-a-kind concert with advanced scenography using 360 virtual reality technology. On May 3, 2016, a-ha gave a multimedia performance in collaboration with Void, a Norwegian computational design studio. The stereoscopic VR-experience was made available for Android users directly through a YouTube app and also made available for iPhone users and other platforms. The concept involved several motion detectors that reacted to the band's movements, voices and instruments. 3D cameras, 20,000 lines of code, 1,000 square meters of projection film and massive projectors were set up as a visual show that turned the Spektrum arena in Oslo into a light installation and visual experience that unfolded live for the audience instead of a pre-programmed sequence. In December 2016, a-ha announced that they would go on a European acoustic tour in early 2018. They also stated that they were going to be producing an album and film from a series of acoustic performances, slated for June 2017, with the release scheduled for November 2017. In mid-June 2017, they recorded an MTV Unplugged special in the remote Norwegian island of Giske under close secrecy, with no phones or recording equipment being allowed into the studio. The CD, DVD, and Blu-Ray recordings were released in October 2017. The European acoustic tour was also renamed from "An acoustic evening with a-ha" to the "MTV Unplugged tour 2018". In August 2017, the band confirmed the acoustic album would be titled Summer Solstice, and would feature two new A-ha songs, titled "This Is Our Home" and "A Break in the Clouds". The video for "This Is Our Home" was released in September 2017, followed by the Unplugged versions of "The Sun Always Shines on TV", "The Living Daylights" and "Take On Me", the latter of which received widespread acclaim for re-imagining the pop classic. The acoustic version of their hit "Take On Me" reached a new generation of people when it was featured in a key dramatic scene of the movie Deadpool 2 released in May 2018. The YouTube video of the song with the title "Take On Me (MTV Unplugged) - Deadpool 2 Soundtrack" has received more than 5 million views between May 15 and July 1. In November 2012, all three bandmates were appointed Knights of the 1st Class of the Royal Norwegian Order of St. Olav for their contribution to Norwegian music. To date the band is the most successful global pop music act to have emerged from Norway. In its heyday in the mid-1980's the band achieved chart topping success in England and the United States, and it was subsequently commercially successful in non-English speaking areas of the world such as Germany, France and in South American countries. In 1986, A-ha received eight MTV Video Music Awards during one award show. Their music video for the song "Take On Me" is considered to be one of the most distinctive music videos from the 1980's. Songs by A-ha, either in original form or in the form of cover versions have also been included as background music and performances in episodes of popular television series, such as Baywatch, Melrose Place, South Park, Smallville, Cougar Town, Private Practice, The Leftovers and The Simpsons, as well as in promotions for shows like Dance Moms. A-ha's music has also been featured in movies such as One Night at McCool's, Grosse Pointe Blank and Corky Romano. They have written and performed a James Bond theme song – "The Living Daylights" for the film The Living Daylights. They have a Guinness World Record from 1991 for drawing the largest paying audience at a pop concert with 198,000 people at the Estádio do Maracanã stadium in Rio de Janeiro. In 2006 the band was awarded the Q Awards Inspiration Award. Ahead of the 30th anniversary of the Rock in Rio festival in Rio de Janeiro, a poll made it clear that the Norwegian band A-ha's appearance in 1991 and their record audience number that year was what people remembered best and the highlight of its 30-year history. As a result of this, A-ha were invited to reunite for a performance at the festival, celebrating 30 years since their debut album's release. Several bands and artists have mentioned that they like A-ha, including Chris Martin of Coldplay, Sarah Brightman, Adam Clayton of U2, Graham Nash of Crosby, Stills, Nash & Young, and Pitbull. Christina Aguilera and Pitbull performed the song "Feel This Moment" which contains sampling of A-ha's "Take On Me" live at the MGM Grand during the 2013 Billboard Music Awards with a surprise appearance from Morten Harket. Aqualung Take On Me Appeared in the 2014 season finale of the series Grey's Anatomy. Also available for download. For a more extensive list of artists who have performed cover versions of A-ha's songs, go to A-ha's discography. Following the success of their debut, the band was nominated for a Grammy Award for Best New Artist in 1986 but did not win. A-ha did win eight MTV Video Music Awards, six for "Take On Me" and two for "The Sun Always Shines on TV". "Take On Me" was also nominated for Favorite Pop/Rock Video at the American Music Awards of 1986. A-ha have won 10 Spellemannprisen awards, the Norwegian equivalent of the Grammy awards. As of 7 May 2016, A-ha have staged 609 concerts around the world. ^ "Best-selling albums of 1986". BBC. Retrieved 13 May 2008. ^ a b "Allmusic: A-ha (Albums)". Allmusic. Retrieved 25 March 2011. ^ a b c d e "A-ha to break up after 25 years". BBC. 15 October 2009. Archived from the original on 17 October 2009. Retrieved 15 October 2009. ^ a b c d e "Certified Awards Search". British Phonographic Industry. Archived from the original on 11 May 2011. Retrieved 25 March 2011. ^ "MusikWoche | Universal und MM Merchandising Media veredeln A-ha mit Platin". Mediabiz.de. 25 January 2010. Retrieved 4 October 2010. ^ Michaels, Sean (16 October 2009). "A-ha to split after 25 years". The Guardian. London. Retrieved 23 April 2010. ^ "A-has siste triumf (A-ha's latest triumph)" (in Norwegian). oslopuls.aftenposten.no. 4 December 2010. Archived from the original on 8 December 2010. Retrieved 10 December 2010. ^ "12 minus og like blid (Minus 12 and Still Happy)" (in Norwegian). side2.no. 2 December 2010. Retrieved 10 December 2010. ^ "Rock in Rio e A-ha se unem na celebração de 30 anos de ambos". O Globo. O Globo. 13 May 2015. Retrieved 13 May 2015. ^ "Cast in Steel Tour". 4 September 2015. Archived from the original on 6 November 2015. Retrieved 4 September 2015. ^ "A-ha synger inn en halv milliard (A-ha singing in half a billion)". Dagens Næringsliv. 18 September 2010. Retrieved 23 April 2019. ^ "Rhino releases (Find Hunting High and Low and click on the three dots)". Rhino Entertainment. Retrieved 7 January 2018. ^ Rolling Stone; circa 1986. "The Icemen Cometh" by David Fricke, page 18. ^ a b c "Allmusic: A-ha (Singles)". Allmusic. Retrieved 25 March 2011. ^ a b c d e "British Album Chart". UK Top 40. Archived from the original on 7 March 2008. Retrieved 7 March 2008. ^ "Much Music Retro Video Spotlight". Much Music. Archived from the original on 20 April 2008. Retrieved 13 May 2008. ^ "RIAA Certifications". RIAA. Archived from the original on 27 May 2012. Retrieved 7 March 2008. ^ a b c d e "Gold-/Platin-Datenbank (A-ha)" (in German). Bundesverband Musikindustrie. Retrieved 7 March 2008. ^ a b c d "ABPD Certifications for A-ha". ABPD. Retrieved 25 March 2011. ^ "Kampen mot A-ha-produsentene" (in Norwegian). Puls. Retrieved 7 March 2008. ^ "Norwegian Album Chart". VG-lista. Archived from the original on 29 January 2009. Retrieved 7 March 2008. ^ a b c "Swiss Certifications". Swiss Hitparade. Retrieved 7 March 2008. ^ a b c "A-ha biography". Archived from the original on 13 October 2003. Retrieved 13 May 2008 – via Pandora Archive. ^ "Scoundrel days". A-ha.com. Archived from the original on 31 December 2014. Retrieved 30 December 2014. ^ "Certifications Albums Platine – année 2001" (in French). Disque en France. Archived from the original on 6 March 2012. Retrieved 25 March 2011. ^ Footman, Tim (1 September 2000). "Guinness World Records 2001". Mint Publishers, Incorporated. Retrieved 17 December 2017 – via Google Books. ^ "Kiso Siefert Dropmann newspaper advertisement". Musicweek. Archived from the original on 16 February 2010. Retrieved 24 April 2014. ^ "Rocklist.net...Q magazine Recordings Of The Year". Rocklistmusic.co.uk. Retrieved 24 April 2014. ^ "Archived copy". Archived from the original on 8 October 2016. Retrieved 21 August 2014. CS1 maint: Archived copy as title (link) News item announcing the webcast. ^ "A-ha returns to synthpop with new album 'Foot of the Mountain'". Side-line.com. Retrieved 4 October 2010. ^ "Chartverfolgung/A-Ha/Longplay". Musicline.de. Archived from the original on 22 May 2010. Retrieved 27 March 2011. ^ "European albums: Week of July 04, 2009". Billboard magazine. Archived from the original on 26 March 2011. Retrieved 27 March 2011. ^ "BBC Radio 2 - Dermot O'Leary, 25/07/2009". Bbc.co.uk. 25 July 2009. Retrieved 24 April 2014. ^ "A-ha to headline iTunes Live festival on 24 July". Side-line.com. 6 July 2009. Retrieved 4 October 2010. ^ "Archived copy". Archived from the original on 1 May 2016. Retrieved 21 August 2014. CS1 maint: Archived copy as title (link) News Item from Official Website. Retrieved 21 August 2014. ^ "Billettservice: A-ha: OSLO SPEKTRUM". Billettservice. 15 October 2009. Archived from the original on 31 October 2010. Retrieved 15 October 2009. 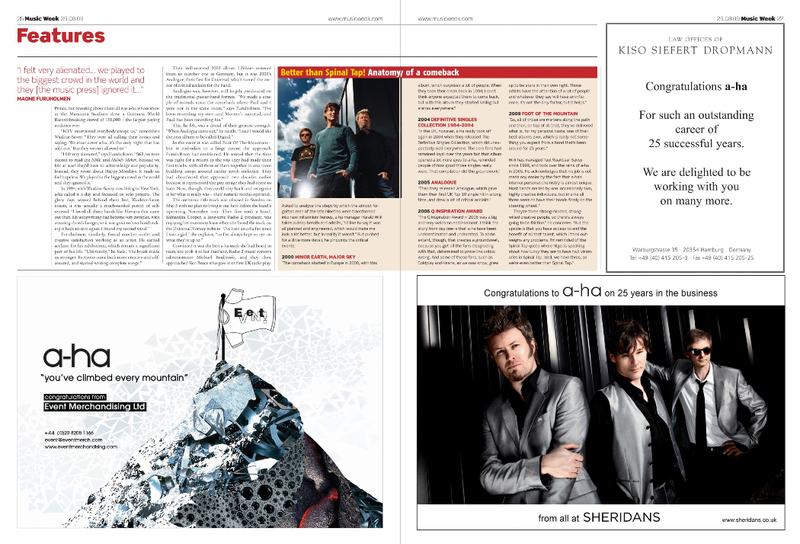 ^ "A-ha to release expanded editions..." Side-line music magazine. 16 March 2010. Archived from the original on 25 March 2010. Retrieved 8 April 2010. ^ "A-ha fan café: New A-ha song ?". Ahafancafe.blogspot.com. 30 May 2010. Archived from the original on 8 July 2011. Retrieved 4 October 2010. ^ "A-ha-live.com". A-ha-live.com. Archived from the original on 6 October 2010. Retrieved 4 October 2010. ^ "Worldwide premiere for A-ha's new single!". A-ha official website. Archived from the original on 23 September 2010. Retrieved 4 October 2010. ^ "Deluxe albums enter US Billboard charts". A-ha official website. Archived from the original on 22 September 2010. Retrieved 4 October 2010. ^ "A-ha member Magne Furuholmen struck with heart disease – The real reason behind the end of A-ha? – A-ha news at". Side-line.com. 1 November 1962. Retrieved 24 April 2014. ^ "Hosted by TV 2 AS". Tv2underholdning.no. Retrieved 24 April 2014. ^ "Lawo digital recording for A-Ha's first (and last) live DVD". lawo.de. 10 December 2010. Archived from the original on 4 May 2011. Retrieved 26 March 2011. ^ "Ending on a High Note Live DVD". A-ha official website. Archived from the original on 29 April 2011. Retrieved 26 March 2011. ^ "Amazon.de: Ending on a High Note: Final Concert [DVD] (2010)". Amazon.de. Retrieved 27 March 2011. ^ "Amazon.de: Ending on a High Note – The Final Concert – Live at Oslo Spektrum (Deluxe Edition) [CD+DVD, Box-Set] (2010)". Amazon.de. Retrieved 27 March 2011. ^ "Amazon.de: Ending on a High Note: Final Concert [Blu-ray] (2010)". Amazon.de. Retrieved 27 March 2011. ^ "a-ha.com: A-ha will perform as part of a national memorial service". a-ha.com. Archived from the original on 15 August 2011. Retrieved 10 August 2011. ^ "a-ha.com on Twitter". Twitter. ^ "A-ha to reunite in Rio". Aftenposten. ^ Norsk Hydro (3 May 2016). "The technology behind A-ha Afterglow - HYDRO" – via YouTube. ^ "Preparing for Afterglow. News. The Official Website of a-ha". ^ "a-ha Afterglow. News. The Official Website of a-ha". ^ "a-ha med ny plate, film og turné". Retrieved 18 June 2017. ^ "A-ha receives prestigious award – Music Export Norway". Musicexportnorway.no. Archived from the original on 17 November 2012. Retrieved 22 February 2013. ^ "Utnevnelse til St. Olavs Orden". kongehuset.no. 6 September 2012. Retrieved 22 February 2013. ^ "A-ha tildeles St. Olavs Orden – Music Export Norway". Musicexportnorway.no. Archived from the original on 19 July 2012. Retrieved 22 February 2013. ^ "Morten Harket: Jeg føler meg stolt, men kanskje mest forlegen – Aftenposten". Aftenposten.no. Retrieved 22 February 2013. ^ "Nå er de riddere av 1. klasse – kultur". Dagbladet.no. 18 August 2009. Retrieved 22 February 2013. ^ "Jeg er mer forlegen enn stolt – VG Nett om A-ha". Vg.no. 1 January 2012. Retrieved 22 February 2013. ^ "Kommentar: Ridderlige A-ha – VG Nett". Vg.no. 1 January 2012. Retrieved 22 February 2013. ^ "Kongens orden til kongene av pop – Kultur-og-underholdning – NRK". Nrk.no. Retrieved 22 February 2013. ^ "HBO-serien "The Leftovers" hylles for bruk av a-has "Take On Me"". Retrieved 18 June 2017. ^ "Q Magazine | Music news & reviews, music videos, band pictures & interviews Q Magazine". News.qthemusic.com. Archived from the original on 30 December 2013. Retrieved 24 April 2014. ^ Berekvam, Øyvind (10 June 2008). "Coldplay hyllet A-ha". Adressa.no. Adresseavisen (newspaper). Archived from the original on 7 October 2008. Retrieved 24 April 2014. ^ "Martin: 'I'm A Big Fan Of A-Ha'". Contactmusic.com. 20 April 2005. Retrieved 24 April 2014. ^ Vågenes, Hallgeir (19 June 2000). "A-ha – Sarah Brightmans favoritter – A-ha – VG". Vg.no. Retrieved 24 April 2014. ^ "U2: – Skummelt likt A-ha – Musikk". Dagbladet.no. 16 November 2000. Retrieved 24 April 2014. ^ "Synger for A-ha – Musikk – NRK". Nrk.no. 14 June 2005. Archived from the original on 7 December 2014. Retrieved 24 April 2014. ^ "Pitbull Co-Hosts "The View", Planning "A-ha Moment" with Latest Hit". ABC News Radio. 19 April 2013. Retrieved 30 December 2014. ^ "'Billboard' awards put on one impressive Vegas show". Usatoday.com. 20 May 2013. Retrieved 24 April 2014. ^ "Pitbull + Christina Aguilera 'Feel This Moment' With A-Ha Frontman Morten Harket at 2013 Billboard Music Awards [Video]". Popcrush.com. 19 May 2013. Retrieved 24 April 2014. ^ Jørstad, Atle (20 May 2013). "Harket på scenen med Aguilera og Pitbull – Hollywood – VG". Vg.no. Retrieved 24 April 2014. ^ "Tour. The Official Website of A-ha". A-ha.com. Archived from the original on 13 April 2014. Retrieved 24 April 2014. ^ Creative, Sugar Rush (13 November 2017). "A-ha Tour - MTV Unplugged & Summer Tour 2018 - Buy Tickets - a-ha". a-ha. ^ "A-ha – Tours". Memorialbeach.com (Fansite). Archived from the original on 12 June 2000. Retrieved 4 October 2010. Wikimedia Commons has media related to A-ha.